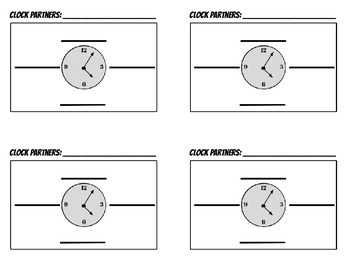 Use this document to copy a classroom set of clock partner cards on card stock paper. Write students' names on the top blank. Then either fill in their partners for 12 o'clock, 3 o'clock, 6 o'clock or 9 o'clock, or let them choose their partners. Double check that everyone has an assigned partner for each time. This is a great way to use partners in your classroom.